TORONTO, ON – Ontario Beverage Network reports that a brewery and taproom in the works since last winter will be opening today in Toronto’s Leslieville neighbourhood. 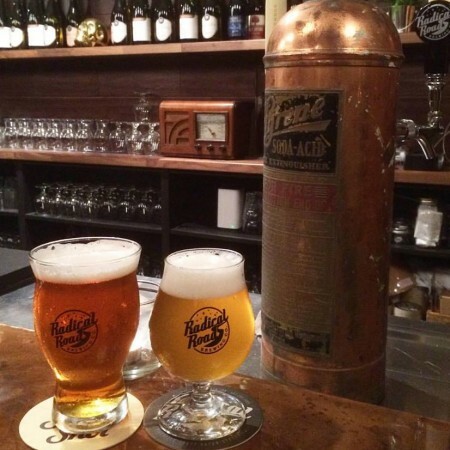 Radical Road Brewing has been founded by Simon Da Costa and Jonathan Hodd, former brewers at Toronto’s Black Oak Brewery where they brewed a pair of beers under the Radical Road name in 2013 before putting the brand on hiatus while working on a permanent location. Now established at 1177 Queen St. E. in Toronto, Radical Road will be opening as a taproom with three house beers available – Slingshot California Common, Shoreline Saison and Yuzu Pale Ale – along with other beverages and a full food menu. A grand opening event will follow in October to coincide with the debut of a bottle shop and three additional beers on tap. For more details, see the Radical Road Facebook page.